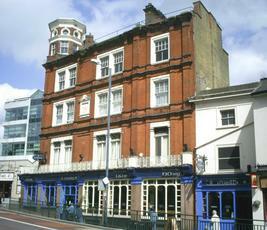 Now called THE RAILWAY TAVERN. Very handy for station. Good selection of ales and food. Extremely friendly service. We intended one round but ended up staying for two! On the upside it's under refurbishment, reverted to the original name of The Railway Tavern and under the stewardship of Nicholsons. I'm hoping that happier times lay ahead for this place. It's hard to imagine how something as uniformally underwhelming as an O'Neills can go downhill, but the current ownership seems to have managed it. Clearly staff and management couldn't give a toss judging by their general attitude. When its quiet, its the sort of bar where the staff see a customer coming and hide out the back, or shoot out from behind the bar to collect some non existent empties. When busy (any more than two people at the bar) you can expect a wait of at least twenty minutes, while half the bar staff look busy doing nothing and the other half struggle with such brain taxing trials as finding a wine glass and pouring some wine into it, or taking a food order (for some reason even a basic order of burger and chips seems to involve a ten minute telephone discussion with the kitchen). Count your change. I remember the old days in here when the staff regularly tried to "wet change" people. Now they aren't even subtle. Last time in I bought a pint with a twenty pound note and got less than a fiver change (if you are going to try to steal, at least take a round tenner so there's some doubt). I called the woman back, but she ignored me and then disappeared upstairs never to return. The remaining staff behind the bar also ignored for ten minutes. In the end I had to shout at the nearest staff member that I wanted to see the manager. Suddenly, the woman magically reappeared and gave me the right change (she didn't even question my claims or check the float, so she clearly knew what she'd done). Otherwise, general neglect. The quiz machine has been out of order for about 6 weeks now - nobody seems to have noticed. There was been a broken pint glass on a shelf next to the fruitie for about 3 months - probably still there. Gents toilets are permanently flooded and either the cubicle doors get kicked in on a weekly basis or they just don't bother fixing them any more. I don't bother trying to get in at weekends now, but apparently the live music has now been replaced by a DJ. Unfortunately this place will survive because of the rugby trade, tourists, and people who don't know better. I'd guess that 90% of people who come here once don't return. Not much has changed here since my last review. It's everything you expect from an O'Neills. On a Wednesday evening, we could get a table and service was much more efficient than on my last visit. 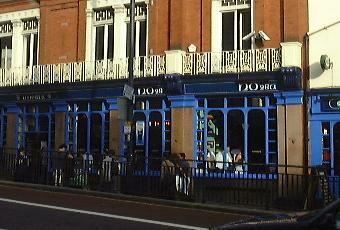 3 ales were on - Pride, Doom Bar & Ubu. Aspalls is the cider. Very close to the station, it's often a venue for meeting up with people, before hopefully moving on. Location: right next to the station, so perfect if you are rolling off a train and want a quick one on the way home. Food: I wouldn't. O'Neills food isn't great anyway, and having seen the state of this place at weekends I'd have serious worries about the hygiene. Weekends: Friday and Saturday nights tend to be a meat market for the over thirties crowd. They used to have some good bands on a Saturday and Sunday night, but I'm guessing they've worked out that drunken rugby players will listen to anything because the last few times I've been in the music has been awful. I think they now do karaoke on a Sunday. Bouncers: worth a mention because they are actually nice reasonable people. There's very rarely any trouble here (I guess because it's an older crowd) and I've often managed to get in with a group of mates, even after having a few liveners elsewhere.